Welcome to The Wardobe, the Narnia Rating Community. Here, members may post pictures of themselves and answer extensive survey questionnaires to find out what character from C.S. Lewis's The Chronicles of Narnia they most identify with. This means you will get voted based on how you answer the questions, what your personality is like, and who you most look like from the books. Many parts of the community are still under construction, so please bear with us. We are in the process of starting this community and stamps are being made, so not all characters may have stamps yet. That does not mean that we aren't going to make one for your possible favorite character, it just means we're taking our good time finding the best possible person/animation to use. All of the coding the application needs is already there; the lj-cut, the bolding of the questions, and the image coding. Please pay attention to the last part of most of the questions, and assume that any question that doesn't have it, is always followed by one word -- Why? One or two sentences does not qualify as an answer. It does not give the voters enough insight as to who you are. Longer, more detailed answers make it easier for the voters to get a good idea of who you are, and therefore, give you a better stamp. If your application is too short, you will be asked to resubmit it. The lj-cut is already in there, all you need to do is put whatever text you would like it to say, such as "At the sound of his roar, sorrows will be no more", whatever you like. There are three links for images in there already, but if you would like to post more than three images, simply copy and paste the link already there for as many pictures as you have, and then plug in your links. You will need to upload your images to a hosting site prior to doing so, such as Photobucket or ImageShack. 1. No BS. Be polite -- this includes using profanity and coarse language in a rude manner or in a harmful way towards any of the members. 3. No stealing graphics or stamps without being stamped or joining the community. 4. You must join to post, but you do NOT have to be stamped to vote on other members. 6. Promotion. Once you are stamped, you should promote the community. Not so much that you're spamming up places, but let your friends know, promote it in communities you're a part of if that community allows promotions. 8. Activity. You need to try to vote on at least five applications that week [if there are that many in a week]. We're not going to go after you with an axe if we see you aren't doing exactly five, but as many as you can. 9. You must be 13 or over to join, because those are the rules we just made up because LJ says so. 10. When voting on an application, bold your vote, like so-- <*b*>King Caspian<*/b*>, remove the *s. This way the mod can scroll through the comments and pick out the votes easily apart from the other text when stamping time rolls around. That being said, please DO NOT bold any other text in your comments on the applications EXCEPT FOR the vote, this is tiring for the mod to have to sort through, especially in the case of having a lot of comments. Also, do not strike up personal conversations in the comments of the applications. Move it over to your personal journals, instant messenger, what-have-you. A few comments discussing your character vote and why you decided to vote that character are encouraged, but please keep it to that. You're welcome to discuss other Narnia related things in other posts you make in the community that have to do with Narnia. 11. 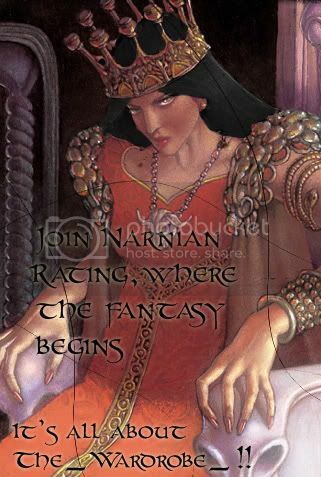 Feel free to post in the community after you're stamped, promotion for other communities, things to do with Narnia such as pictures, fanfictions, poems, questions you have about the books you wish to discuss, as well as information on other fantasy movies you think the other members would be interested in. When making these posts, however, just put "Stamped" in your subject title. 12. There is no set amount of time from the time you submit your application to the time you are stamped. Ideally, we want to get every member stamped within three to five days of their submitting their application, but we do not stamp people unless they have a decent amount of votes, as it doesn't seem fair to stamp them when they only have three to seven votes. As soon as you have a good amount of votes, you will be stamped as promptly as possible. Which brings us back to encouraging you to PROMOTE! The more people promote, the more members we get, the more votes new members get! 13. Do NOT hotlink the stamps or any of The Wardrobe's other graphics. 14. In the subject title for your application, put "Once a king or queen in Narnia, always a king or queen" so that we know you've read the rules. 15. Any other questions, please e-mail one of the mods, wild_and_caged or eyes_of_nymphus. Once you've been stamped and you're voting on other members, feel free to put a small signature at the bottom of your post saying who you were stamped as and who stamped you. This is not mandatory, but it just helps people remember who is who. Promotion of other communities is accepted, but no more than one time for each community. We don't appreciate spammed up boards. By the Lion's mane, enjoy yourself! This list is still under construction. If you have a question about a character you would like to vote who is not on the list, please e-mail one of the mods. If you would like to be an affiliate, please e-mail one of the mods. Other rating communities only, or communities pertaining to The Chronicles of Narnia.